If you think that you really need to lose weight in your face, there are ways to accomplish the task ahead. We will cover those 3 fields: lifestyle changes and diet, exercise and facial exercise. Diet – There is no strict diet involved. It is more like eliminating some things from your daily diet, and adding more of something else. But, let’s start this topic and you will see for yourself what we are talking about. Excessive use of salt in your meals may make your face look puffy. That is because salt is causing retention of water in your face, making it to look “fat”. So, go easy on salt. Drink more water! If your body is not getting enough water, it will start retaining water. And yes, first place to retain water would be your cheeks. Avoid it. Alcohol equals sugars, it may lead to dehydration, but also make your face more round. Plus, it has a lot of empty calories and is counter-productive when you are trying to lose weight. Healthy Weight Loss Diet – When you enroll yourself on a Healthy Weight Loss Program, you’re burning fat healthy way. The good news is – your face will be the first place to lose the excess fat. Right now! Smoking makes your skin look and feel older. Smoking related fine lines on your face may contribute to an impression of sagginess. If you’re not getting enough sleep, your face may look bloated. Additionally, less then optimal 8 hours of sleep, may cause hormonal imbalance and you will tend to eat more and crave unhealthy foods. Shorter haircut may help your face to look thinner. Longer hair can make your cheeks look fuller. If you are using makeup, let it work toward your goal. Darker lipstick will make your face look heavier and fuller. Aim for lighter shades. Also, learn how to emphasize certain features on your face and make it look thinner. Facial Massage – With regular facial massage you can lose considerable amount of fat from your face. It enhances oxygen and blood circulation which, in turn, helps tighten your skin. Doing full-body exercises will help you lose weight in your face as well. Cardiovascular exercises such as running, swimming and biking will help burn calories, but doing weight training will help you build lean muscle. Having a lot of lean muscle will boost your metabolism and help you burn even more calories throughout the day. Get at least 30 minutes of exercise three times per week. 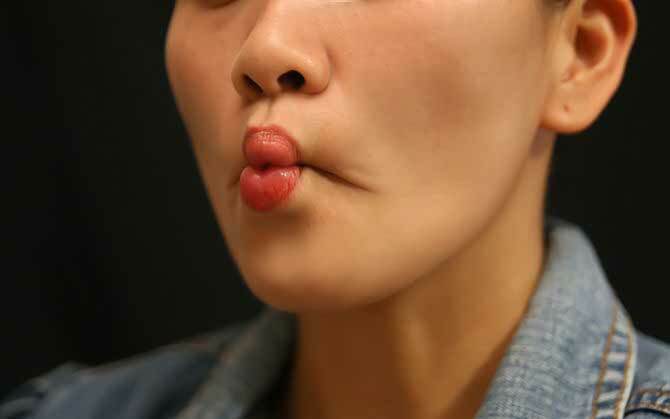 Facial Exercises – Chewing gum is great. Say X-O in a row. Repeat as many times as you can. Make a fish face, few times in a row. Chin Lifts: tilt your head towards the ceiling, keeping your eyes fixed towards it. Now, make your lips tight, as if trying to kiss the ceiling, hold it till a count of 10 seconds and relax. Repeat 10 times. How to Lose 20 Pounds in a Month by Consuming only One Ingredient!